Another Monday...Another sketch challenge from MJ! This weeks sketch was a challenge - kinda reminded me of the sketches with the arrows! Hmmm....what was I gonna do with those two circles on the sketch? I usually do things in groups of three, so this one had me stumped. Then I decided to scale down those circles and add brads to a tag instead, I think it works. For my focal image, I colored the flowers from Friends 24-7 with markers, then stamped them onto my watercolor paper, and Ink Washed them. I then recolored my stamp with markers, used my Stamp-a-ma-jig, then stamped back over the images to add the line art back to my image. Note to self...now would be a good time to heat set the ink before you sponge the edges....Sponge edges with Close to Cocoa Ink. Use Spritz Tool and Chocolate Chip ink to cover up any smeared images you may have. To create my tag, I used the Sizzlits Lots of Tags, cut from Chocolate Chip card stock, then cut again from Baja Breeze card stock. The perforations on the die cut, make it easy to cut the oval and layer it over the first tag. The little gems you see, are actually from the Rhinestone Brads. If you turn your brads over, open the legs of the brad, you'll see a little piece holding in the Rhinestone, simply pry the metal piece open, pop out the brad, apply a glue dot and you have instant stick on bling! Here's MJ's original sketch if you'd like to play along. Thanks for stopping by, have a great week! So pretty. I love the colors they are just beautiful. And you are right the brads (bling) and the tag work. Great job, thanks for playing along. Absolutely gorgeous!!! 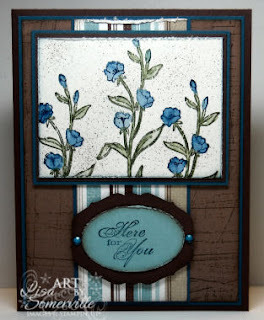 Love those colors and how you used the tag for your circles! JUST GORGEOUS!! Really very pretty! 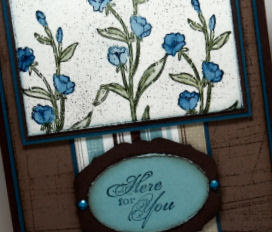 Gorgeous cards, I love those colors together they are so rich!